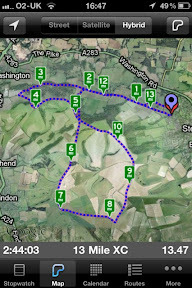 As well as recording the data as to how far and how fast I have run it also works with Google maps to show the route. 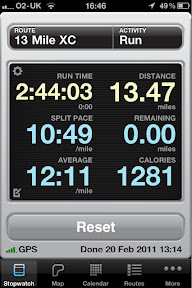 All the data is saved and you can compare previous runs to your current run. There are various audible announcements that can be configured at set intervals to let you know your average pace, how long you have been running and the distance you have covered. One of the best features from a safety viewpoint has to be it's ability to email someone at regular intervals with the data from your run including unlink to goggle maps that shows your current position. I mostly run on my own and it is nice to know that if I ever fell and hurt myself someone would a)notice and b) know where to start looking ! 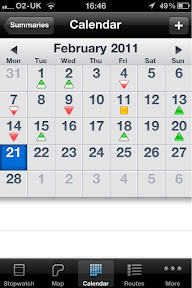 The following are some screen shots from the app of my iPhone. This time next week I will be a bit nervous !